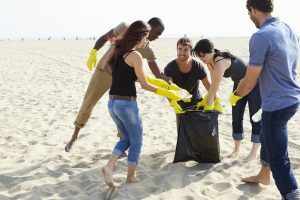 In the summer months you can raise money with a beach cleanup day. At this time of year, people spend much more time at the beach, and leave a lot more litter behind: bottles of sunscreen, plastic wraps and bags for food, even magazines and paperback books (or the odd discarded toy). Whether left on purpose or not, this trash can easily start building up on a beach — after all, not many beach goers would think to bring a plastic bag to collect their garbage, so it gets left (or buried in the sand). You'll often find the beach being used as an ashtray and general dumping ground by people who won't be back again for another 12 months. While this is an annoyance it offers the opportunity to raise some money and improve your local environment at the same time. Do the rounds in your local neighborhood and community, asking for people to pledge suitable amounts for every quarter mile of beach that you manage to clean up. Alternative, donors can pledge based on time spent rather than distance covered. You'll need plenty of volunteers for the task as well as plenty of large trash bags to collect everything you're going to find. The best method is to get everyone in a consistent line from the water's edge to the end of the sand — your team then slowly works down the beach and picks up any kind of trash they come across along the way. Make sure your volunteers are assigned with gloves to protect their hands. You could have a second group following behind to collect the trash bags as they are filled and to supply new ones. You might need a large truck or two to take the collected bags of trash to the nearest landfill, depending on the amount of ground you are looking to cover. To raise even more money for your cause, separate the trash from anything recyclable as you go. Some facilities pay a small amount for collected plastic bottles or aluminum cans (and even if you don't get paid, it's still kinder to the environment to go down the recycling route). Early evening (when it's still light out but a little cooler) is a good time for a beach clean up, and you won't run into as many people this way. You might want to provide bottled water for your employees to keep them cool while they pick up litter, but be sure not to leave them behind! I think that this is really nice for the wildlife tat live at the beaches.